Pantograph engraving is a versatile, traditional and tried and tested method of engraving something that requires a little more individuality or bespoke feel to it. You may have a new plaque you wish to have engraved, or an old one you would like to add something to, our Engravers can handle it with speed, accuracy and with a professional touch. 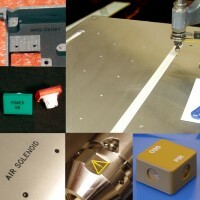 The Pantograph also has the capability of engraving Mould Tools, Electrodes, Labels, Panels, which can be awkwardly shaped or sized items that the CNC and Laser might not be able to accommodate. Just recently we have been asked to engrave on an Oak Bench with names and Love Hearts so don’t hold back, we don’t just help businesses we help everyone. We very rarely have to say no to a request and will always try to find a way to help. Pictured are some blow mould tools for bottle bases, these are typical of some of the tooling we engrave on the pantograph machine. Some of the injection mould tools we undertake can be large and awkwardly shaped(inset), we can handle this, no problem. These tiny items pictured are used for precision tool identification and require careful & precise use of the pantograph machine. Copper spark erosion electrodes (also shown) are another area we cover with ease, from a simple letter to complex graphic image. 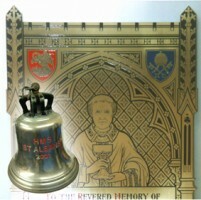 Engraving onto a specially made award takes care and consideration, especially in matching what has been done previously. Our many years of experience in this field means you can be confident that the result will be consistent and of high quality. We can also help with the design and manufacture of any new project you may require, starting with a simple sketch right through to production. Sometimes in, addition to having the engraving you require, the item in question may need some refurbishment, as in the examples shown. The large brass church plaque stood about 4 feet tall and needed refinishing and then re-filling with enamel to match the original. Much of the work we do on the Pantograph is of an Industrial nature. Anything which is too awkward, in size or maybe too difficult to hold, for the CNC machine, means the Pantograph comes into its own. 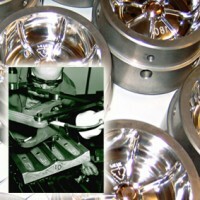 Buttons, large control panels, machinery fascias, tallies, and complex cast equipment boxes are all typical. 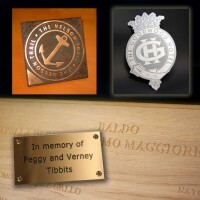 Ranging from a brass plate on a commemorative bench to a large wooden memorial plaque, almost any material is viable for your required project. Also in the picture are the Nelson Trail plaque which was cast in bronze from a ”pattern”, engraved by ourselves, and also a crest for the Goodwood Hotel which was acid etched into Stainless Steel. In addition to the materials shown there are many laminates of varying colours also available, as well as anodised aluminium with different surface finishes.